This questionnaire is tailored toward gaining a better understanding of the potential traveler’s level of functioning in the areas of socialization, independence and over-all level of functioning. A more detailed medical evaluation will be required to be completed once your traveler has been accepted into our program. Important: Please answer the following questions to the best of your ability with complete honesty with regard to your answers. Remember, this is a program for those with special needs. We need to know about strengths and weaknesses to better service your traveler’s needs. Therefore, answering questions honestly and fully will contribute to a successful summer experience for all. This is an interactive form. Please complete all Steps 1-6 and submit when all fields are completed. 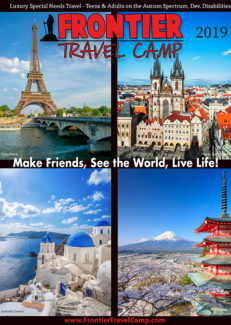 Note: All information supplied in this application is strictly confidential and protected by Frontier Travel Camp, Inc. This information WILL NOT be shared to anyone outside of Frontier Travel Camp, Inc. staff, GUARANTEED! Where does the traveler live? Is the traveler currently employed? How did these work experiences end? Does the traveler have a car? Does the traveler use public transportation independently? Has the traveler ever traveled without family? Please share any additional information you would like us to know about this subject matter? Hospitalizations due to non-medical reasons? Has the traveler had any history of depression? Any history of suicidal ideation? Any history of physical, emotional and/or sexual abuse? Would you consider the traveler sexually active? Does the traveler exhibit sexually provactive behavior? Is there any reason to believe that the traveler would attempt to initiate sexual behavior with a roommate and/or traveling companion? Does the traveler have temper tantrums? Does the traveler have any history of fighting with peers? Does the traveler exhibit aggressive/confrontational behavior (i.e. bullying, antagonizing, name calling, etc.)? Does the traveler use illegal substances/drugs? Is the traveler capable of taking care of all basic hygiene needs (i.e. bathing, washing, brushing, etc.)? Is the traveler capable of using words to let needs be known (i.e. ailments, expressions of feelings, dietary needs, etc.)? Is there any speech deficit? Is the traveler capable of making purchases and/or ordering food unassisted? What kind of social outlets, if any, does the traveler have? Please include frequency and duration. Please describe any social difficulties that the traveler may have. Please be as specific as possible. Is there anything that you can tell us that may make the traveler more comfortable during the first few days of the tour (i.e. words that typically cheer-up the traveler, photos of family, televisions shows, music, etc.)? Thank you for taking the time to completely and accurately complete this application. Please remember that a more detailed medical evaluation will be required once the traveler has been accepted into our program.